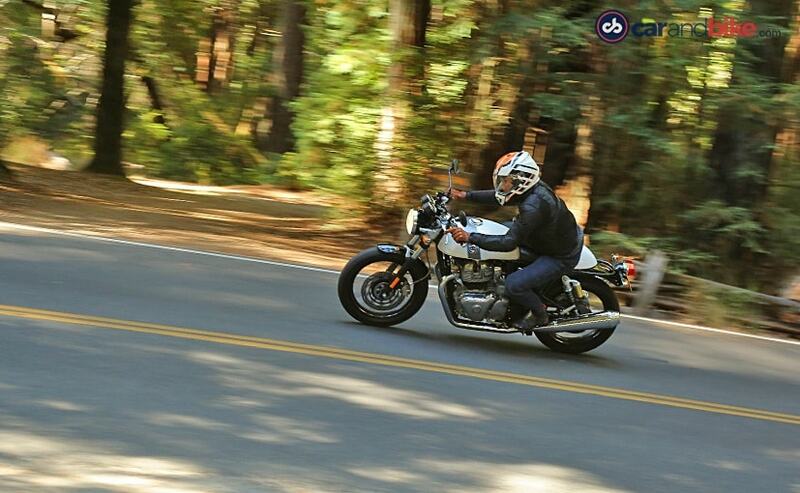 We've already ridden the new Royal Enfield Interceptor 650 in California. The Royal Enfield Continental GT 650 is a caf racer based on the same 650 Twin platform as the Interceptor 650, but it has a slightly sportier personality. 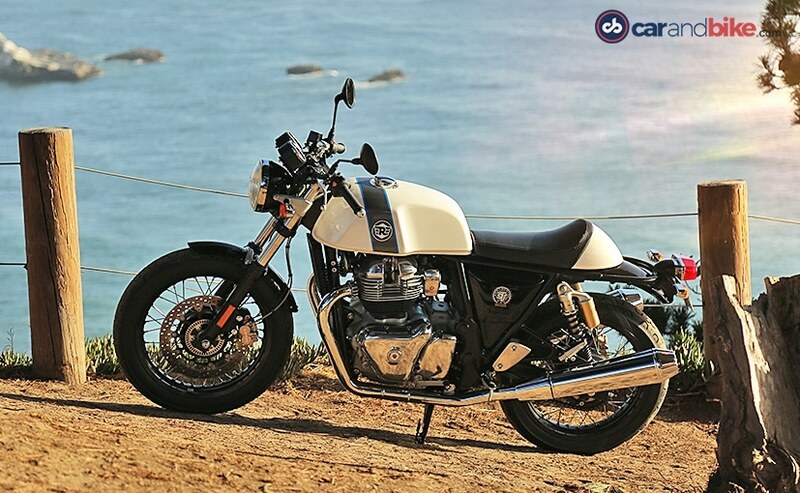 The Royal Enfield Continental GT 650 will be available in three variants - Standard, Custom, and Chrome, each with distinctive styling cues, although the basic motorcycle is the same. 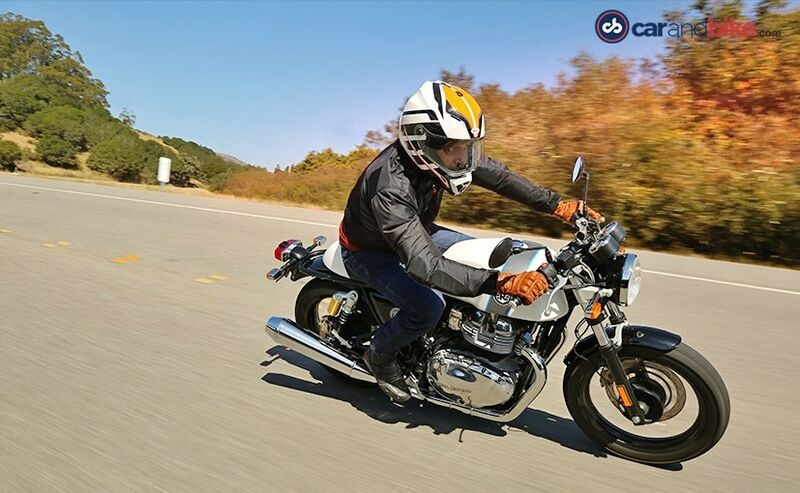 The basic difference between the Interceptor 650 and the Continental GT 650 is that the GT has sportier ergonomics, and is slightly lighter, thanks to a different steering yoke, clip on handlebars, and most importantly, the centre stand, which the GT doesn't get. The fuel tank is marginally smaller as well, with recesses to lock your knees in. The RE Continental GT 650 with a 198 kg weight without fuel, is 4 kg lighter than the RE Interceptor 650 at 202 kg. The difference in weight may not be much, but the personality of the bikes is quite different. The Continental GT 650 follows classic café racer styling, with clip-on handlebars, and a riding position where you crouch down low on the bike with rearset footpegs. The different riding position is immediately apparent from the relaxed, upright riding position of the Interceptor 650. The chassis development team spent months of testing prototypes with riders of different weight and build to fine tune the handling. But more importantly, the brief was clear - the Continental GT had to have twin shocks at the rear and the same basic platform to give it its authentic period design, but it had to have intuitive and sporty handling. The fuel tank design is inspired by the 1960s Continental GT and the clip-ons, though lower set, offer more practicality than providing an outright aggressive riding position. 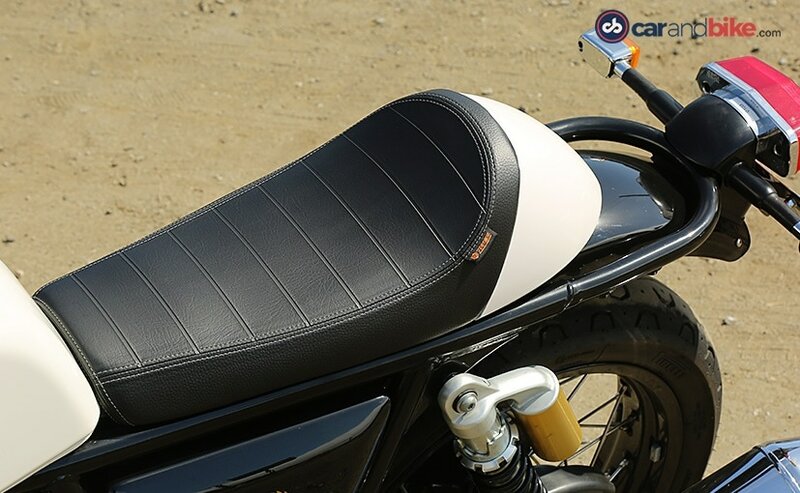 The stock seat of the GT 650 has a standard removable seat cowl towards the rear, but an accessory solo seat is also available, like the one on our test bike. The period sporty café racer design is evident, yet the Continental GT 650 offers a practical approach. The clip-on handlebars with the rider forward and rear-set foot peg position offer a blend of steering feel and cornering clearance for sporty riding. 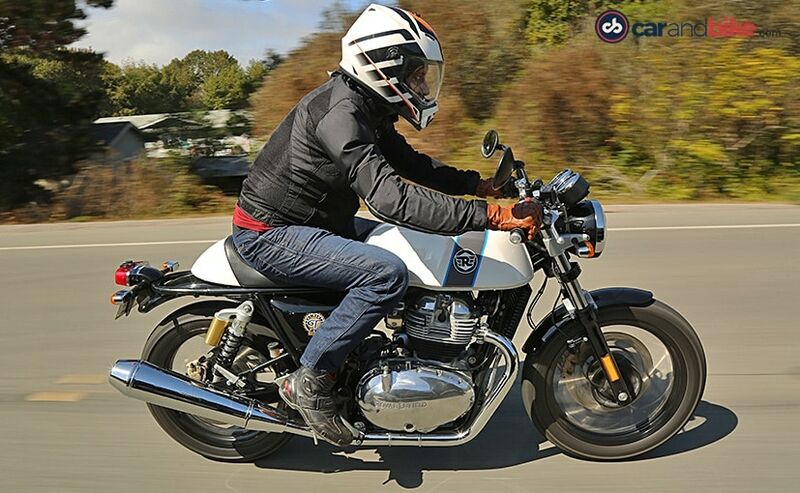 The new Continental GT 650 though is not based on the older Royal Enfield Continental GT 535. The riding position isn't as aggressive as the 535, and even though the GT 650 is a café racer, it has more comfortable ergonomics. 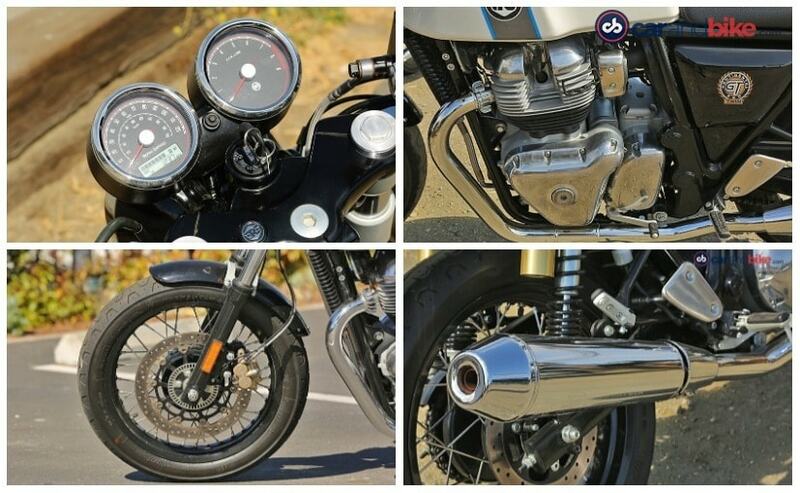 The RE Continental GT 650 shares the same 649 cc, air-cooled, parallel-twin engine with the Interceptor 650. The air/oil-cooled counterbalanced motor puts out 47 bhp at 7250 rpm, and 52 Nm of peak torque at 5250 rpm and is mated to a brand-new 6-speed gearbox has been specially developed for the 650 Twin platform, after thorough testing to improve shift feel and the right gear ratios. The result is a slick-shifting gearbox, which is smooth and slots into position with precision. The slip and assist clutch has a light feel at the lever, and should be quite handy in our traffic conditions. It's to be noted that the gearbox is so refined and smooth, that many of us resorted to clutch-less upshifts and downshifts while riding through the canyons up to Big Basin State Redwood park and then down to our lunch stop at Mountain Terrace resort, across the intersection from Alice's Restaurant, a popular eating spot for local motoring enthusiasts. The counterbalanced engine is super smooth; in fact, it's the most refined engine on any Royal Enfield motorcycle we've seen so far. The power delivery is smooth and entertaining throughout the rev range, and it actually hits the rev limiter under full-clip acceleration. Power delivery is linear and the torque kicks in under 3,000 revs, making for a very likeable mid-range; only upwards of 6,000 rpm is when the power begins to taper off, but by then you'd already be in the range of 140 kmph. On several occasions on our test route, which involved a fair bit of the Pacific Coast Highway, or Highway 1, as it's called, we saw the speedometer needle heading upwards of the 160 kmph mark. On most highway duties, the GT 650, like the Interceptor 650, can effortlessly cruise at 130-140 kmph. The Continental GT 650's suspension is shared with the Interceptor 650. So, it gets the same 41 mm front forks, and coil-over rear shocks, but the shocks are adjusted on the stiffest position to offer more tautness in handling. And handling is superb, just a push on the clip-ons is enough to countersteer through a set of left and right twisties, and the GT certainly feels more planted, and more taut, while carving corners around the foothills of the Californian Rockies. The 18-inch wheels are shod with Pirelli Phantom Sportcomp tyres, which were specifically developed for the 650 Twin platform. Both wheels come with disc brakes, a 320 mm single disc on the front wheel, and a 240 mm at the rear, with standard dual-channel ABS from Bosch. The brakes work well, as we discovered while negotiating a series of turns and coming almost head-on with a Chevy pick-up on a single-lane section after Big Basin State Redwood Forest. The Royal Enfield Continental GT 650 is the café racer Royal Enfield always should have had in its portfolio. 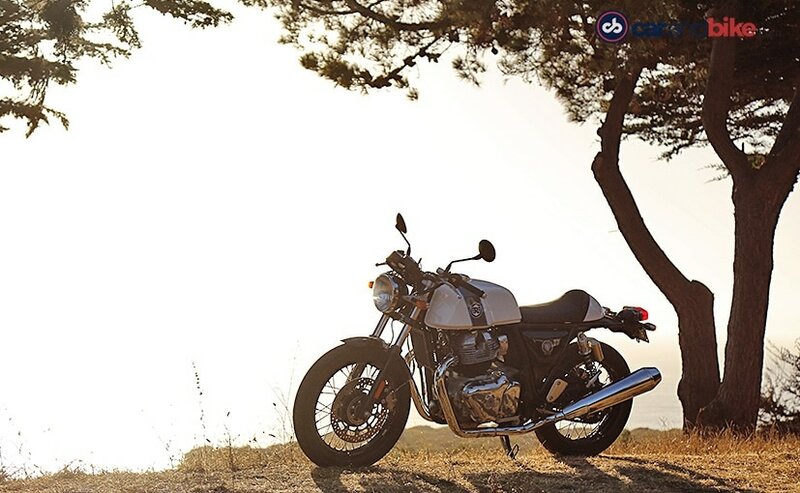 A superb engine, fantastic road manners and easy accessibility make the Continental GT 650 a great bike to have for the occasional blast through your favourite roads, and even for in-town duties. The sporty riding position may not be suitable for inter-state distances, but our test ride route of more than 200 km in a day's riding left us little to complain about. Of course, the committed position feels a little different initially, but it only takes a few minutes to get used, and a break every once in a while is all you need to stretch your limbs before you straddle the GT 650 for another hour or so of carving canyons through back roads. Royal Enfield has really upped the game with the 650 Twin platform, offering two flavours in a package that has little shortcomings. The only thing we need to see is how the ride quality is on our road conditions back home, since our test route only offered smooth tarmac, on the highway and in the back roads that we went through. The RE Continental GT 650 offers a unique proposition. The committed café racer styling and ergonomics may not be as practical as the Interceptor 650, but it begins to grow on you. 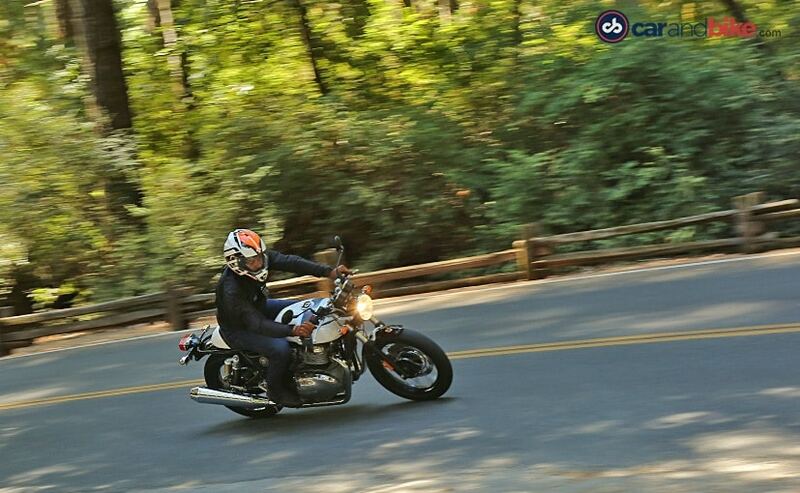 The taut and intuitive handling makes the Continental GT 650 a blast to dip from corner to corner, left to right. 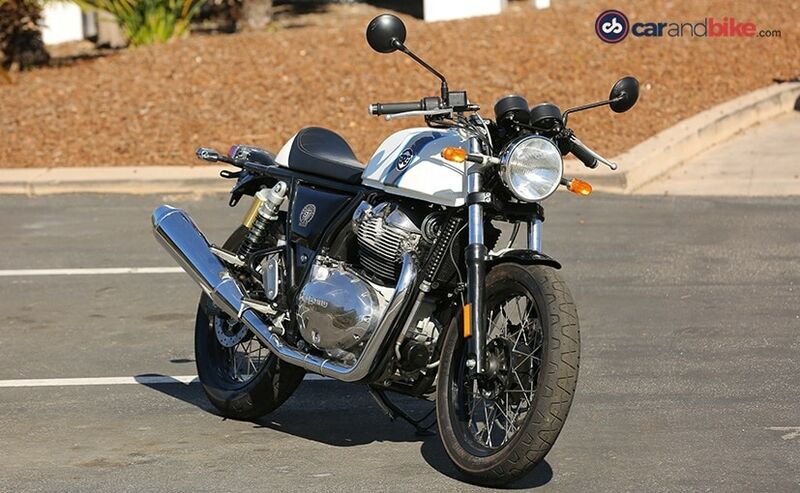 It certainly makes for an engaged riding experience, with an engine and gearbox combination that's the best any Royal Enfield has ever seen. Given a choice, I'd probably still pick the Interceptor 650 for its practicality, but the Continental GT 650 has its own charm and attractive personality. And it has to be experienced first hand on a twisty mountain road to make out the difference and appreciate it for what it is.